Different from most of our worlds’ parts, the Minecraft world has a very few rains. 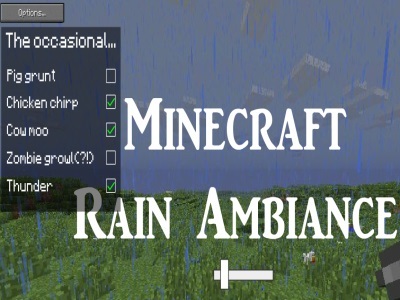 If you have not heard the sound of the Minecraft in a rain yet, play Minecraft Rain Ambiance Ver 1.1 to know! The animals will play the key role in making weird sounds in the rain including pig grunt, chicken chirp, cow moo, and zombie growl. In addition, thunder makes the sound of the rain become real. Enjoy the rain in Minecraft world and see what feelings you have while listening to the sounds of this rain! You put a stick next to the sound which you want it to be heard in the rain.